At Expo Protection in Paris this week, Dupont™ announced the winners of the Kevlar® Glove Innovation Awards and we are thrilled to be one of the first European winners with our TTP042PU - Cut 5 18GG PU glove. The TTP042PU is the next generation of Tilsatec hand protection and the first 18 gauge glove on the market to achieve ISO 13997 level 5 cut resistance. The Cut 5 18GG PU is super lightweight, providing that much sought after second skin feel. The fine, soft liner is constructed to ensure steel cannot come through to the hand, maximising comfort levels for long periods of wear. Designed to deliver a high degree of touch sensitivity and tactility for carrying out intricate tasks and assembly work, this glove pushes the boundaries of what’s possible in hand protection. The Innovation Awards are designed to recognise innovative glove designs from Dupont™ Kevlar® licensees who are meeting evolving market needs. Winning glove entries were chosen based on designs that utilised Kevlar® fibre, were unique and groundbreaking in their approach, and challenged the boundaries of conventional cut protection. 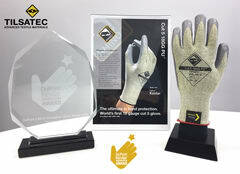 Find out more about the award winning TTP042PU glove here: http://www.tilsatec.com/product/cut5-18ggpu. Tilsatec is established as a leading supplier of advanced textile products, specialising in providing PPE and hand and arm protection for industry. The Rhino range of protective gloves and sleeves, based on the Rhino steel core yarn is unique in the market, engineered to provide extreme levels of cut resistance for the most hazardous and demanding working environments.